Empirically evaluating the impact of demonetisation on inter-bank payment and settlement systems against the backdrop of progressive use of electronic modes and capping service charges, this study finds that (i) there has been a reduction in the usage of cheques prior to demonetisation; and (ii) since demonetisation, cash transactions have moved in a sustained manner to non-cash mode of payment systems via retail electronic payment systems, point of sale terminals and cheques. Within the ambit of inter-bank payment and settlement systems, paper based inter-bank cheque clearing system is the oldest non-cash mode, albeit with the highest settlement time lag and inherent credit and liquidity risks. Therefore, the Reserve Bank of India (RBI) has attempted to reduce the usage of cheques and facilitate increased usage of electronic payments. This study empirically investigates the effectiveness of the RBI’s interventions in migrating transactions to electronic mode. The study also evaluates the impact of demonetisation on non-cash mode of payments. The RBI has intervened to reduce the usage of paper-based instruments on several dimensions. Effective April 1, 2008 it mandated the use of electronic modes of payment for ₹ 10 Million and above in regulated markets and by regulated entities, which was further reduced to ₹ 1 Million with effect from August 1, 2008. The cap on service charges for electronic payment products and for outstation cheque collection that was prescribed since October 8, 2008, incentivised migration to alternate modes, viz., Real Time Gross Settlement (RTGS), National Electronic Fund Transfer (NEFT) and Electronic Clearing Service (ECS) transactions by bank customers. In the NEFT system, a recent policy intervention has been the introduction of more settlement batches in a business day by shortening the settlement duration between batches. For card transactions, various policy initiatives have been undertaken to enhance security measures through introduction of additional factor of authentication (AFA), separating merchant discount rates for debit and credit cards, and relaxing the AFA requirement for transactions up to ₹ 2000/-. The latest technology implemented in cheque clearing system is cheque truncation system (CTS). Retail electronic payment systems, viz., National Automated Clearing House (NACH), Immediate Payment Service (IMPS) and Unified Payments Interface (UPI) have also been set up. In the RTGS system, a major policy change has been the introduction of minimum threshold value for customer transactions, presently at ₹ 0.2 Million. Furthermore, the RBI has introduced service charges for direct participants in RTGS, including time varying tariffs and extending business hours to align them with market timings. Monthly data on the number and amount of inter-bank payment system transactions are published in the monthly bulletin of the RBI2. Non-cash interbank payment systems have been grouped into four categories viz., paper-based, retail electronic payment systems3, cards at point of sale (POS) terminals4 and the RTGS5 system (Chart 1). Overall, it can be observed that RTGS system has minimum volume but maximum value while retail payment transactions and card usage are growing in both volume and value terms. Even as retail payment systems, card transactions at POS, and the RTGS system have been growing steadily, cheque volumes and values have shrunk from 2008-2009 to 2016-2017 except for 2012-2013 in value terms and 2016-2017 in volume terms (Chart 2). The payment systems data have been grouped into three time buckets, viz., pre-demonetisation period from April 2016 to October 2016; demonetisation period from November 2016 to March 2017; and post-demonetisation period from April 2017 to August 2017 (Chart 3). Cheque volumes and values contracted during the pre-demonetisation period but recorded positive growth during demonetisation as well as post-demonetisation period. There was a sharp growth in card transactions at Point of Sale (POS) for both demonetisation and post-demonetisation periods. For inter-bank cheque volumes, a breakpoint shows up in February 2008, which is just a month before the issuance of the RBI’s circular on mandating use of electronic payment systems for transactions of ₹ 10 Million and above (Table 1). (i) Prior to the mandated use of electronic payments, the number of inter-bank cheque clearing transactions showed a statistically significant increasing trend (coefficient γ is positive and significant during April 2005-February 2008). (ii) After the RBI intervention, however, the number of inter-bank cheque clearing transactions showed a decreasing trend over time, which is statistically significant (coefficient γ is negative during March 2008-October 2015). Thus, the RBI’s intervention significantly altered customer behaviour in cheque usage. (iii) In the post-demonetisation period (April 2017-August 2017), an increase in the number of cheque transactions is observed. The ratio of currency with public to GDP reduced substantially during 2016-17. The increase in usage of cheques could be an effect of demonetisation as cash availability was restricted and cheque became a convenient instrument to transfer funds, which takes one or two days given the substantial reduction in settlement cycle on account of implementation of CTS. (iv) As Table 1 shows, the value of inter-bank cheque clearing transactions has a breakpoint in October 2008, when service charges for various payment products were implemented. As observed, there was an increasing trend of cheque value over time till the intervention on service charges, which is statistically significant (coefficient γ is positive and significant during April 2005-October 2008). (v) After the intervention, however, cheque values exhibited a statistically significant decline in trend over time (coefficient for γ is negative and significant during November 2008-August 2017). Clearly, the cap on service charges on electronic payments encouraged their usage and correspondingly, reduced the recourse to cheques of high value. Statistical breakpoints for other data series viz., retail electronic payments, card at POS and RTGS are also detected (Table 3). (i) The retail electronic payments data have multiple breakpoints due to introduction of new systems and other policy interventions over time. (ii) Card transactions at POS terminals have breakpoints during the years 2011-12 and 2014-15 due to implementation of security and risk mitigation measures for “card not present transactions” and relaxation in additional factor of authentication for small value card present transactions. (iii) The RTGS transactions also have multiple breakpoints on account of several policy measures like stipulating maximum service charges for customers, introduction and increase of threshold values for customer transactions, introduction of service charges for RTGS participants including time varying tariff and extension of business hours. Briefly put, the RBI’s interventions in enhancing the efficiency and inclusiveness of electronic payment systems have effectively driven up both volumes and values of electronic payment products against traditional instruments such as cheques. (i) The average monthly volumes and values in retail electronic payment systems and card payments at POS terminals were significantly higher during the demonetisation period than in the pre-demonetisation period and were equal for the demonetisation and post-demonetisation period. This implies that the sudden increase in the usage of retail electronic payment systems and cards at POS terminals during demonetisation persisted in the post-demonetisation period. 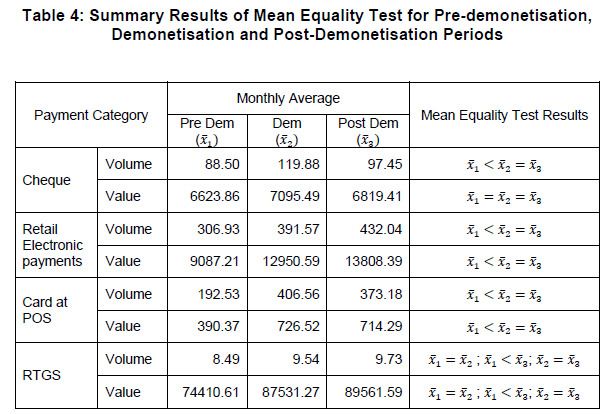 (ii) The average monthly volume of cheques during the demonetisation period was significantly higher than the pre-demonetisation period but was equal during demonetisation and post-demonetisation. However, the average monthly value of cheques was equal for all the time buckets. This implies that during the demonetisation period, there was a sudden increase in cheque volume, though cheque values did not increase significantly, suggesting that a large amount of small value cash transactions moved to non-cash mode of payments through cheques. The increased volume of cheques is sustained in the post-demonetisation period. 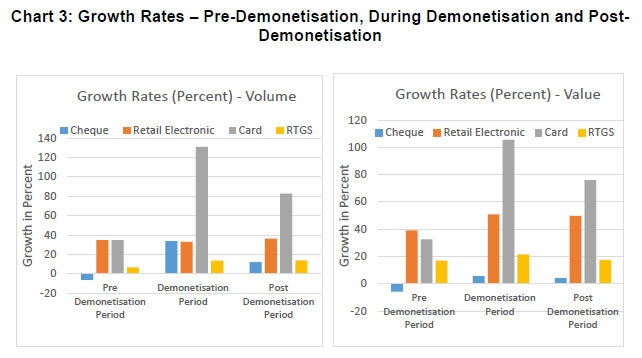 (iii) Finally, the average monthly volume and value for the RTGS system were equal for pre-demonetisation and demonetisation periods. They are also equal for the demonetisation and post-demonetisation periods. This implies that there was no significant impact on the RTGS system during demonetisation. However, the significant increase during the post-demonetisation period over the pre-demonetisation period is indicative of the rising popularity of the RTGS system for high value transactions. In summary, RBI’s interventions on promoting electronic modes of payment appear to have facilitated a reduction in the usage of paper-based instruments, such as cheques. Demonetisation impacted the inter-bank payment and settlement systems significantly in moving cash transactions to non-cash modes of payments in three segments, viz., retail electronic payments, card usage at POS terminals and cheques. The increased usage of these three instruments during the demonetisation period has been sustained in the post-demonetisation period as well, suggestive of a fundamental shift being underway in payment habits of the Indian economy. A. Zeileis, F. Leisch, K. Hornik, and C. Kleiber. strucchange: An R package for testing for structural change in linear regression models. Journal of Statistical Software, 7(2):1–38, 2002. URL http://www.jstatsoft.org/v07/i02/. 1 Sasanka Sekhar Maiti works as Assistant Adviser, Department of Statistics and Information Management of the RBI. The views and opinions expressed in this paper are those of the author and do not necessarily represent the views of the RBI. Author acknowledges feedback of Shri Debasis Nandi, Director, Kum. Nilima Ramteke, General Manager, Dr. Anil Kumar Sharma, Adviser and Dr. Goutam Chatterjee, Principal Adviser. 3 Includes electronic clearing service (ECS), national electronic funds transfer (NEFT), immediate payment service (IMPS) and national automated clearing house (NACH). 4 Includes credit and debit cards at POS, as transactions at automated teller machines (ATMs) are primarily used for cash withdrawal and cash deposit. 5 It includes gross transactions – customer and interbank in the RTGS system. 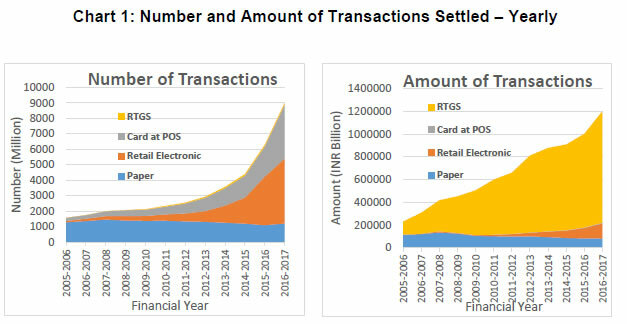 6 The huge annual growth in retail electronic payments during 2007-08 is due to the use of ECS for the initial public offer (IPO) of a large Indian corporate. 7 The function “breakpoint” in the “strucchange” package in R software provides the time point of a structural break in the time series data [Zeileis et. al. (2002)]. 8 The residuals are normally distributed for all the estimated equations and normality tests have been carried out using the package “nortest” in “R”. 9 Figures in brackets represent p-values of respective coefficients; ‘***’ means p-value < 0.001 and ‘**’ means p-value <0.01), both statistically significant. 10 The Welch two sample t-test was employed to get results on statistical significance.